A good battery charger is an essential accessory for any motorcycle enthusiast. A good motorcycle battery charger helps keep your bike ready to go at any moment. Typically, you’ll see less use out of your bike during the colder months. Unfortunately, this means that your bike battery can go flat very easily in the winter when it is not being used. 1 Why Is A Good Battery Charger So Important? Why Is A Good Battery Charger So Important? It all comes down to the fundamental operation of a battery. Many larger batteries for motorcycles and cars are called lead-acid batteries. They consist of a series of lead plates submerged in an acidic solution called the electrolyte. When the battery is used, a chemical reaction between the lead and electrolyte generates electrical energy used to power your car. Running an electrical current through a battery reverses this chemical reaction. Charging a battery consists of using an electric current to reset the potential energy of the battery, allowing it to be used again. Even when a battery is not actively being used, the reaction between the lead and electrolytes occurs. The spontaneous loss of charge from an unused battery is called “self-discharge.” Not using your battery for months can cause it to fully discharge. Even worse, if your battery completely self-discharges without charging, the electrolytes may form hard crystals on the lead plates. These crystals resist electricity and prevent a battery from holding a charge. The solution to this issue is to make sure your battery has a constant charge. A good charger will not only recharge your battery but maintain its charge during periods of non-use. A steady stream of electricity keeps the energy potential of the battery positive at all times so it is ready to go when you need it. Keeping a charge on your battery prevents component degradation and contributes to long battery life. So where should you start with buying a motorcycle battery charger though? The sheer number of products on the market makes narrowing down your purchase seem like a daunting task. Luckily, we are here to give you a list of the best motorcycle battery chargers of 2019. 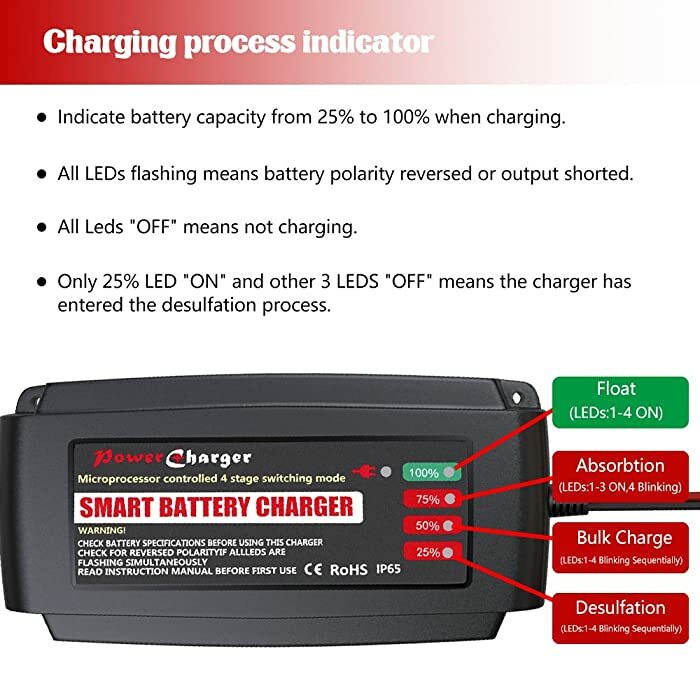 Take these battery charger reviews into consideration before making your purchase. The Foval Automatic is a multi-purpose battery charger so it can be used not only with motorcycle batteries but also with most other 12V batteries found in cars, dirtbikes, ATVs, and more. The Foval Automatic Trickle Battery Charger is 5.8 oz. 12V lithium motorcycle battery charger. The Foval Automatic is a multi-purpose battery charger so it can be used not only with motorcycle batteries but also with most other 12V batteries found in cars, dirtbikes, ATVs, and more. The small size and frame make it ideal for transportation and portable use. The charging technology uses a 4 stage process to efficiently charge the battery and maintain a nearly full charge during periods of non-use. First, the initialization phase starts with a small current to begin charging. Next, the bulk charge mode rapidly charges the battery to about 90% capacity. Next, in the absorption mode, the charger applies a gradually decreasing current to fully charge the battery. In the float mode, the charger drops its voltage to a preset value and periodically give the battery a charge to maintain top levels. With the small size, it’s ideal for transportation and portable use. The Foval also comes with a neat set of feedback mechanisms to ensure charging goes smoothly. The charger has a double fail-safe mechanism that checks both the power supply and battery connectors before supplying a current. 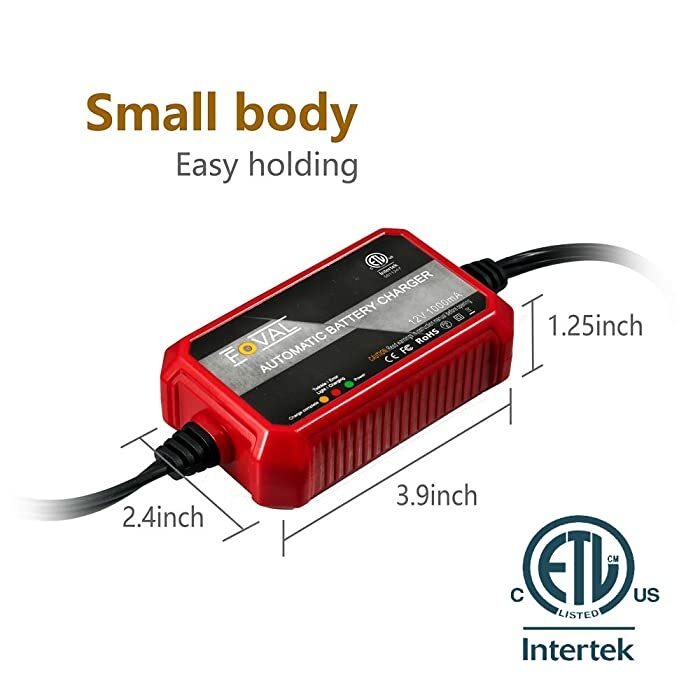 The charger also monitors its progress in real time and dynamically modifies its performance in regards to unexpected changes in voltage or current. This feature is useful for novices who may not know much about batteries and don’t want to mess with the nitty-gritty technical details. The circuits are also micro-engineered to prevent overcharging and short-circuiting. 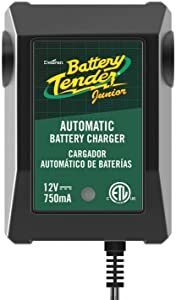 The Battery Tender Jr. is multi-functional and can charge motorcycle batteries, ATVs, RVs, cars, and more; perfect for someone who is looking for an all-in-one battery charger. 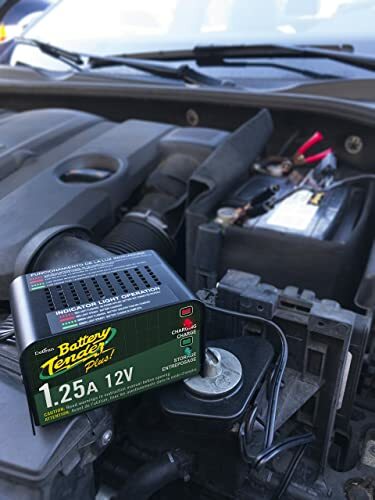 The Battery Tender Junior 12V Battery charger is a powerful device in a small package. The 8 x 4 x 9 casing comes in at less than 2 pounds and is capable out outputting a 0.75A current over an indefinite amount of time. The kit comes with a set of alligator clips and ring terminals so no extra accessories are needed. A 12-foot power cord is included for flexible charging. The fully automatic charger takes the headache out of charging: just plug it in and attach to the battery and you are ready to go. Like many of its competitors, the Battery Tender Jr. uses a 4 phase charging process to optimize charging and prevent overcharging. Two color solid-state LEDs on the casing indicate the state of the charge and indicate if the battery falls under a certain voltage. The device is not meant to charge batteries quickly though; it is more meant as a motorcycle battery trickle charger.. So, it is good for those who may have battery operated devices they do not frequently use. The ideal for motorcycle batteries, ATVs, RVs, cars, and more. The smart microprocessor modulates power levels and its Infinite Sequence Monitoring (ISM) technology adapts to the battery’s needs hundreds of times per second. Reverse hookup protection checks to make sure there is a power source and leads are connected before giving a current. 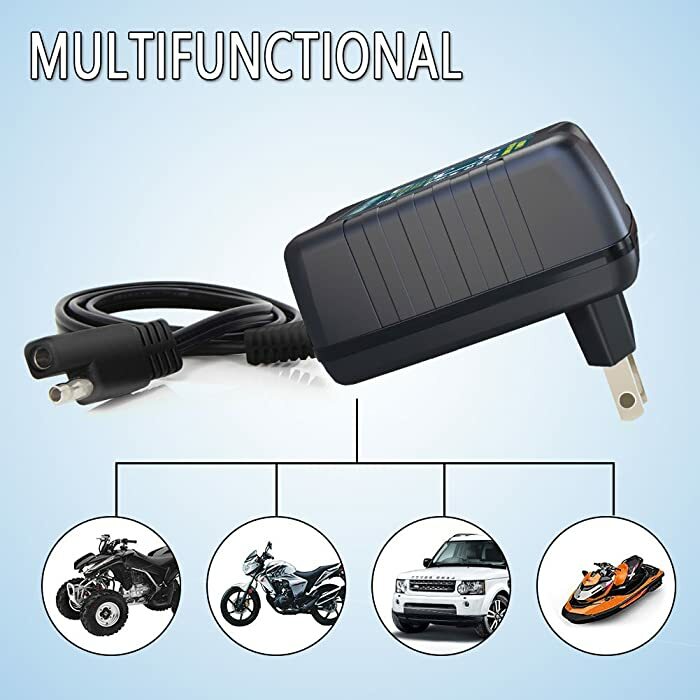 Additionally, the Battery Tender Jr. is multi-functional and can charge motorcycle batteries, ATVs, RVs, cars, and more; perfect for someone who is looking for an all-in-one battery charger. The Battery Tender Plus Smart Battery Charger complete with power and functionality. It’s one of the best battery chargers for motorcycles. The Battery Tender Plus Smart Battery Charger is like the bigger sister to the Battery Tender Jr, complete with more power and functionality one would expect from an older sibling. 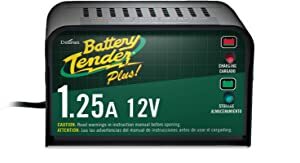 One of the best 12V battery chargers, the Battery Tender Plus is slightly heftier than the Jr., with an 11 x 4 x 11 frame and coming in at 2 pounds. The charger comes with a 6 foot AC power cord, a set of alligator clips, and some ring terminals so it does not require any more accessories to use. It even comes with a set of DC power cables in case you are running a DC power supply. It is a battery charger with outstanding features that users can consider. Like the Jr., the Plus’ 4 phase charging process uses constantly shifting voltages to make sure batteries get fully charged and maintain that charge over long periods of time. The Plus is a bit stronger than the Jr. and is capable of generating a 1.25A current. It automatically switches from charge mode to float mode when voltage hits a certain level. The battery is also temperature sensitive and will modulate its performance in response to changes in ambient temperature. The 2-color LEDs on the case give a simple visual indication when charging is done and the onboard processor modifies charger performance in lieu of changes in voltage, current, or resistance. The solid one-piece construction of the case also makes the device durable so don’t fret too hard if it gets knocked around a bit. 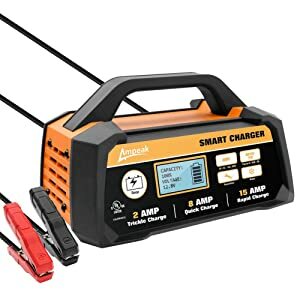 Not as portable as Jr.
the Black & Decker BM3B motorcycle battery trickle charger offers a versatile charger at an extremely affordable price.It comes with a set of alligator clips, ring connectors, and even with a cigarette lighter adapter. 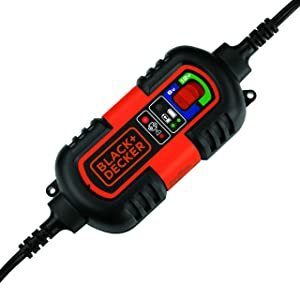 A well-known name among builders and mechanics, the Black & Decker BM3B motorcycle battery trickle charger offers a versatile charger at an extremely affordable price. The casing measures 5 x 3 x 9.8 inches and has a tough polymer grip on the outside so it fits comfortably and securely in your hand. Built into the casing is a mounting bracket so you can secure the charger out of the way on the wall while it is working. The charger comes with a set of alligator clips, ring connectors, and even with a cigarette lighter adapter. The handheld device is capable of generating 1.5A of current and can charge in both 6V mode and 12V mode. Simply flip the switch on the face of the charger to the desired option, plug it in and you are ready to charge. The charger is also compatible with a wide range of lead-acid battery types, including AGM batteries as well as GEL and WET batteries. The compatibility with different battery types and volt-switching capacities make the Black & Decker BM38 very versatile. It can be used with motorcycles, RVs, cars, snowmobiles, and even personal watercraft. Like many charging devices, the Black & Decker BM38 has an integrated set of feedback mechanisms that modulate its performance in real time. Built-in circuit protectors prevent voltage drops, short-circuiting, and reverse polarity. 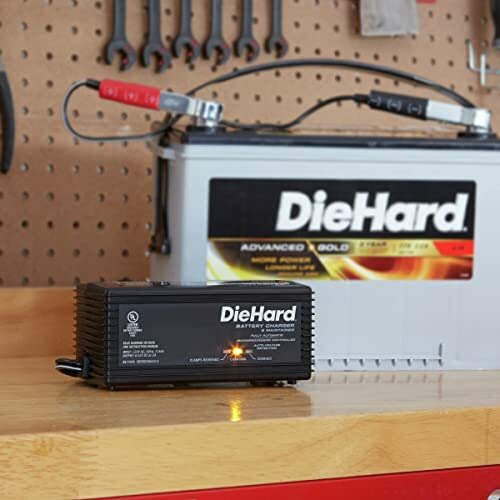 The DieHard 71219 6/12V battery charger and maintainer is a powerful charger that gives battery charging the power and style that even John McClane would admit to. It can switch between 6V and 12V charging so it can be used on a wide variety of batteries. 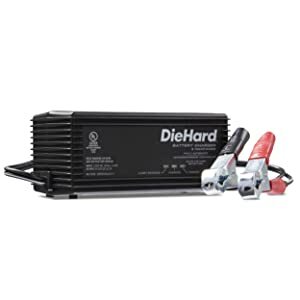 The DieHard 71219 6/12V battery charger and maintainer is a powerful charger that gives battery charging the power and style that even John McClane would admit to. The sleek black casing measures 7.2 x 3.9 x 6.8 inches and weighs 1.45 pounds. The compact rectangular shape gives it a discrete appearance and makes it easy to place out of the way on a shelf or under the seat while it is doing its job. The DieHard 71219 can switch between 6V and 12V charging so it can be used on a wide variety of batteries. 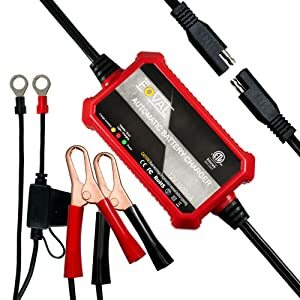 The charger comes with a 2 50A alligator clamps, a set of permanent ring connectors, and a 12V accessory plug to switch between charging voltages. A simple LED display on the case indicates when the battery is charging and when the charger enters float mode. Lastly, a 3-year warranty is available on purchase. This battery charging John McClane ever would admit. The DieHard 71219 uses a patented 5-stage charging process to fully charge and keep battery charge maintained. Like other multi-stage chargers, the 5 phase process continuously modulates current and voltage to achieve and maintain a maximum charge. Charges slowly, meant as more of a maintainer. 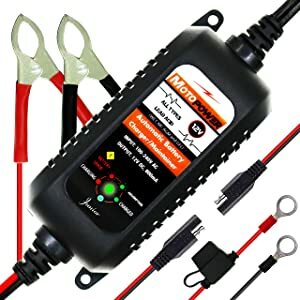 The MOTOPOWER MP00205A 12V battery charger offers a great mix of size, power, affordability, and efficiency. It comes with a set of alligator clips, circular battery connectors, and an SAE quick release adapters that make connecting and disconnecting from the battery easily. The MOTOPOWER MP00205A 12V battery charger offers a great mix of size, power, affordability, and efficiency. The sleek rectangular handheld design is similar to the Black & Decker BM38, and it also comes with a case bracket for mounting. The MOTOPOWER comes with a set of alligator clips, circular battery connectors, and an SAE quick release adapters that make connecting and disconnecting from the battery easily. 4-phase charging technology is included as well. 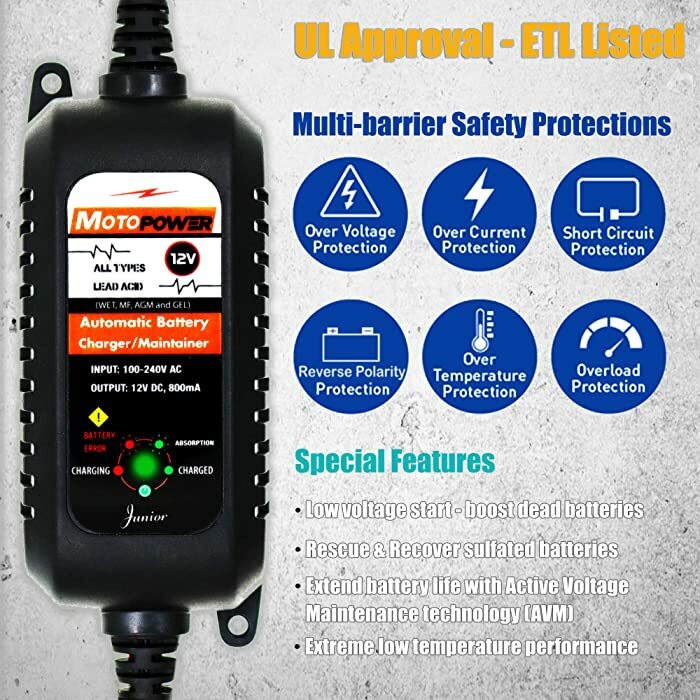 MOTOPOWER MP00205A is multi-barrier safety protections battery charger with special features. The 12V charger is fully automatic as the onboard microprocessor controls the entire charging process from start to finish. The charger uses a 4-phase charging process beginning with an initialization mode and ending with a float mode. The Constant Pulse Current Maintenance function helps the battery avoid excessive charge and discharge. The MOTOPOWER is also designed with energy efficiency in mind. The single LED display requires very little power to use, and the charger has a net 0 voltage when plugged in but not connected to a battery. Lastly, the MOTOPOWER MP00205A comes with a 2-year manufacturer warranty that guarantees full returns on products that fail. It’s ideal for mechanics, professionals, and DIYers as well. It provides with all the necessary functionalities that are required to diagnose a car and find problems. 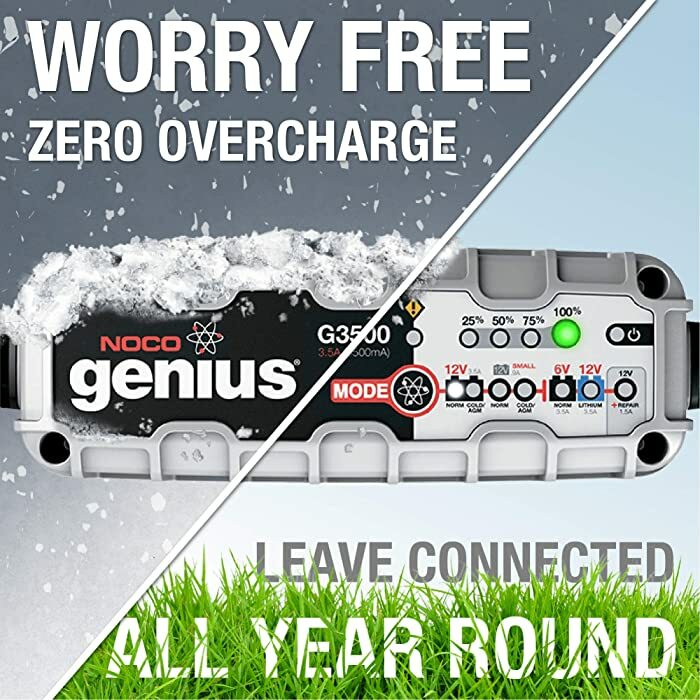 The NOCO Genius G3500 UltraSafe Smart Battery Charger looks like something out of a sci-fi film and it has the tech to back it up. NOCO Genius lithium motorcycle battery chargers are some of the smartest and most advanced chargers on the market, the G3500 included. The appealing colored device measures 7.7 x 2.7 x 1.9 inches and weighs 2.15 pounds. The thick rubber and rectangular design make it slip-proof and easy to store out of the way. On board is a dedicated desulfator plate. It has a 3,5A current output. NOCO Genius G3500 works even in cold weather. The NOCO Genius G3500 has a whopping 7 different charging phases, each meant to charge the battery as efficiently as possible. It maxes out at a large 3.5A current. It can also switch between 6V and 12V charging modes and has spark-proof and reverse polarity technology to keep human users safe. The NOCO Genius even comes with a set of onboard diagnostic tools so you can check if you have a bad battery. Perhaps the most unique feature of the NOCO Genius G3500 is its ability to rejuvenate worn-out batteries. The built-in desulfator device actively cleans the lead plates in batteries and prevents electrolyte solidification and build-up. The activity of this device can bring a battery back from the brink and return it to functionality, making it a lifesaver for someone whose battery is in not so great shape. The ultra-compact design is easy to store and can fit snugly in your trunk, garage shelf, or in a bag. It comes with a set of DC power adapters and an onboard diagnostic function. 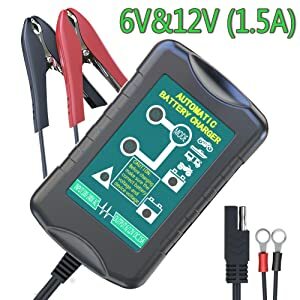 The LST Trickle 6V/12V Battery Charger is a nice portable motorcycle battery trickle charger that can be used in a wide range of contexts. The small handheld design measures 1.5 x 3.2 x 1.7 inches and weighs a bit more than half a pound. The ultra-compact design is easy to store and can fit snugly in your trunk, garage shelf, or in a bag. It comes with a set of DC power adapters and an onboard diagnostic function. The LST has switchable 6V and 12V channels and uses a standard 4-stage charging process. It can be used on motorcycles, cars, boats, and many types of lead-acid batteries. Automatic charging takes care of the process from start to finish and modulates charging in response to battery needs. It also has a built-in diagnostic function that will indicate if your battery is damaged. Ideal for motorcycle, car, street bike and so on. Like the NOCO Genius, the LST has a dedicated desulfator that cleans the lead plates in the battery. The multi-LED display has lights to display a 50% charge, 100% charge, and separate light for independent battery failures. The fully sealed outer case has no creases so it is resistant to dust and moisture. The Ampeak Smart Battery Charger is one of the best 12V battery chargers on the market. It offers a lot of functionality backed by the reliable Ampeak name. The Ampeak Smart Battery Charger is one of the best 12V battery chargers on the market. It offers a lot of functionality backed by the reliable Ampeak name. A bit heftier than the other reviewed products, the trapezoidal casing measures 9.8 x 5.3 x 3.9 inches and weighs 4 pounds. On the tops is a convenient carrying handle and attached to the back is a useful fixture for wrapping and strong cords out of the way while the device is being used. The Ampeak has a retro orange and black motif that makes it look somewhat like an old-school radio. The outer shell is made of a durable rubber-like material that is heat-resistant, sturdy, and wear-resistant. Multiple current options stand at 2A, 8A, and 15A. It ensures safety during charging battery. The key features of the Ampeak are its strength and versatility. 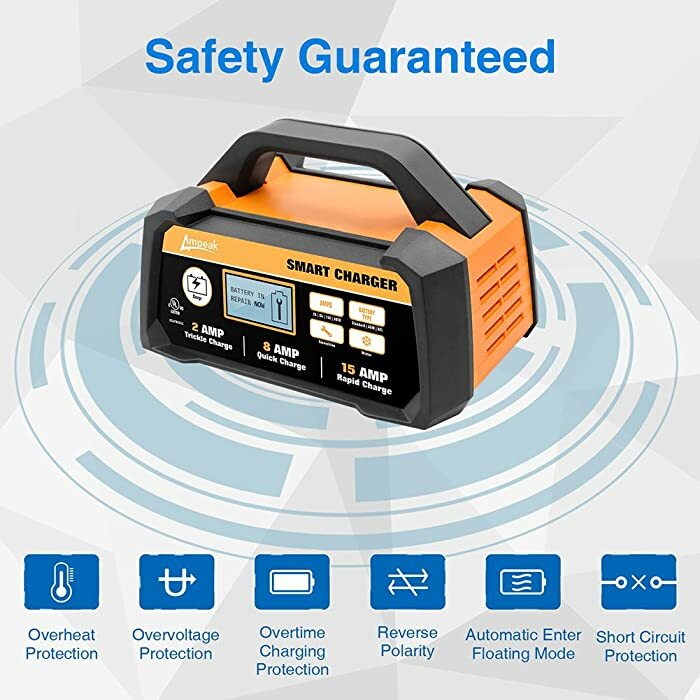 It is specified for operation under a wide range of temperatures (0 – 40 °C) and the smart fast charger can output 2A, 8A, or 15A of current depending on battery needs. It also comes with a dedicated winter mode for long-term charging in the cold months. The large solid state capacitors have a long life and the aluminum heat sink dissipates extra heat. The Ampeak also comes with a built-in cooling fan to keep its temperature constant. The fan is responsive to the energy output of the charger and changes accordingly. The BMK is capable of charging from both DC and AC power supplies and it modulates its current to reflect that. It also has an energy saver mode that minimizes energy usage when not attached to a battery. The BMK 12V Smart Battery Charger gives consumers an extremely versatile charger at an affordable price. Composed out a tough industrial grade ABS plastic, the device measures 9.5 x 4.6 x 2.9 inches and weighs about 1.7 pounds. It comes with separate attachments for AC and DC charging. Current output ranges from 1.5 to 5A. 4-phase technology ensures charging is complete and efficient. On the front is an LED display for checking the stage of charging. The BMK is capable of charging from both DC and AC power supplies and it modulates its current to reflect that. On DC, the charger produces a 5A current which is ideal for fast charging. AC mode runs at 1.5A of current and is more ideal for slow charging and battery tending. The charger uses a 4-stage charging process that begins with an initial pulse meant to desulfate the lead plates. It also has an energy saver mode that minimizes energy usage when not attached to a battery. It is designed to inform for users of the charging process. The BMK has a simple 4 light LED display that indicates when the battery is 25%, 50%, 75% and 100% charged. When all 4 LED lights are on, the battery is fully charged. You can then disconnect and use it or keep the charger on float mode to maintain a charge. Which product is the best battery charger? 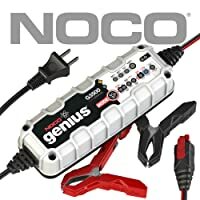 All of the reviewed chargers have their pros, but overall, the option that seems the most powerful and highest-quality is the NOCO Genius G3500. The charger is sturdy and sophisticated, capable of not only charging your batteries but rejuvenating them from degradation also. Its 7-phase charging makes it very efficient and its onboard diagnostic tools can help you self-diagnose a bad battery. The major drawback to the NOCO is its complexity and relatively limited usage. The complex display can intimidate novices and it is specified for use on lithium metal batteries, not other kinds of lead-acid cells. Alternatively, if simplicity is your goal, then the Black & Decker BM38 may be your best bet. The automatic charging is ready to go right out of the box and there are no complicated bells and whistles to trip you up. It is compact and portable, so it can be used in-home or on the go. It is also very affordable and has a 1-year manufacturer warranty at purchase. Ultimately though, the best battery charger comes down to your personal needs. How frequent will I be charging? If you need to charge a device that you frequently use, a more powerful charger with a higher current may be best. A lower current charger is better for batteries that see infrequent use. What kind of battery? 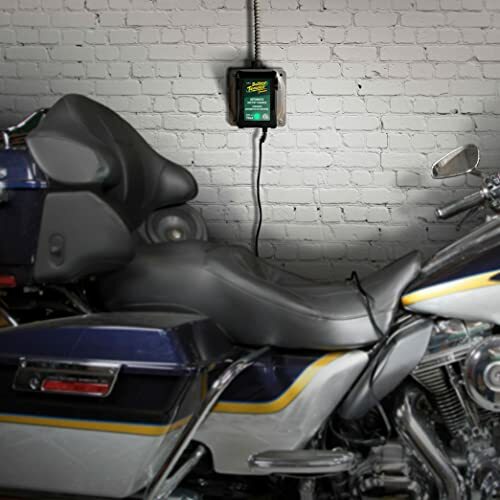 Make sure your charger can charge at the voltage required by your motorcycle. Most motorcycles have a 12V battery but some have a 6V battery. Make sure the charger you buy fits your battery needs. Using an incorrect voltage on your battery can damage it and even cause explosions in extreme circumstances. Travel or home use? The majority of the reviewed products can be used on the go or at home. However, you should still ask yourself how often you will be charging at home versus how often you will be charging on the go. If you are on the go a lot, then a compact portable charger may be best for you. Charging at home? A bigger stationary charger may be better. 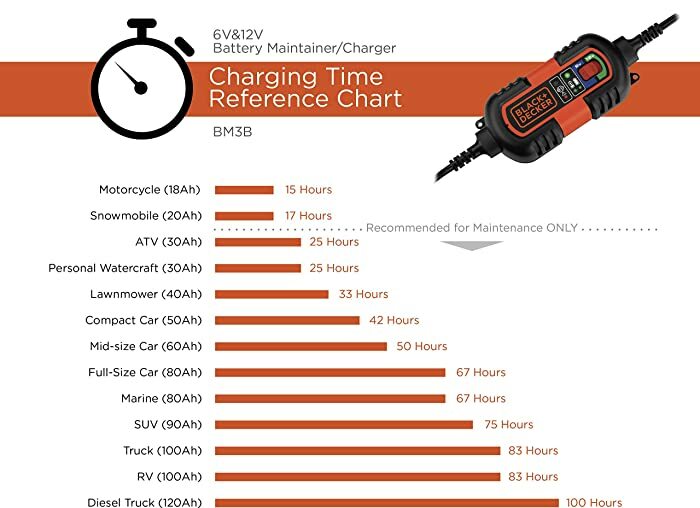 What are the best motorcycle battery charger brands? The most well-known brands are probably Black & Decker, NOCO, Battery Tender, and Ampeak. All brands have been around for a while and have secured a footing as reliable motorcycle charger manufactures. 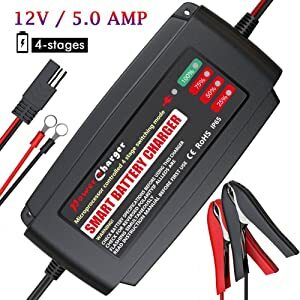 Can I use a car battery charger on a motorcycle? It depends on the voltage of the battery, not the device the battery is in. Most battery chargers can work on both car and motorcycle batteries, provided they are lead-acid design. Most car and motorcycle batteries are 12V, and some motorcycle batteries are 6V. Make sure your charger is made for the voltage of your battery and it should be fine. Do I need to disconnect my motorcycle battery before charging? It depends. If you are slow trickle charging your motorcycle, then normally you can leave the battery hooked up while charging. The low current should not damage the battery while connected. If you want a fast charge with high current, then its best to remove the battery first. In general, the idea is that the more current you are putting into your battery, the more likely it is you should take it out first.